Inspired by the luxury, opulence, and quality of 1920’s classic motor yachts, Roi Soleil plies the Canal du Midi in dapper and distinguished style. Stately design and patrician décor in the public areas epitomizes elegance with rich leather seating and plush textiles, subtly accented by pristine mahogany and brass trim. The cabins abound with many deluxe details, such as designer French fabrics, ample storage and elegant handmade tiled bathrooms. Numerous windows and skylights in the lounge offer incredible panoramic views of the canal, encouraging guests to linger, perhaps enjoying a glass of wine or cup of tea. Built with both an aft and bow deck, the Roi Soilel boasts ample outdoor space, including a hot tub, in which guests can relax and just admire the beautiful scenery as it drifts by. Bicycling is another popular activity for those so inclined to discover the countryside on wheels. An open kitchen provides another popular spot for guests to mingle, thanks to the Chef’s informal cooking demonstrations. Indeed, culinary magic is to be expected aboard Roi Soliel, as the menu focuses on regionally inspired dishes crafted from market fresh produce, while hand selected wine pairings reveal the nuances of the Languedoc’s bounty. Unique to the Roi Soleil’s experience is the daily sightseeing program. Guests “choose their own adventure”, selecting their guided excursions from a curated list of exciting activities and exclusive events and in the area. Wine tasting, visiting Roman ruins, and exploring charming villages are just a few of the options offered. Of course, on such a glamorous vessel, a topnotch crew looks after guests with approachability, professionalism, and warmth. Enjoy this short video about the good life aboard the Roi Soliel! In the afternoon, you will be met by a crew member of the Roi Soleil at the designated meeting point. From here, relax as you are chauffeured to the barge moored nearby. Experience a sunset cruise to Portiragnes before your first of many gourmet dinners onboard. Take a dip in the hot tub with a night cap to finish the day. 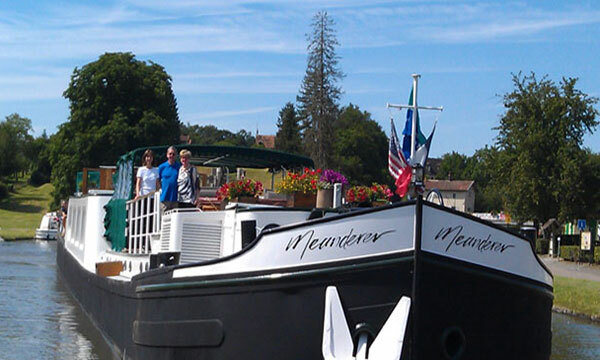 This morning, Roi Soleil cruises through the amazing 7-lock staircase of Fonserannes. 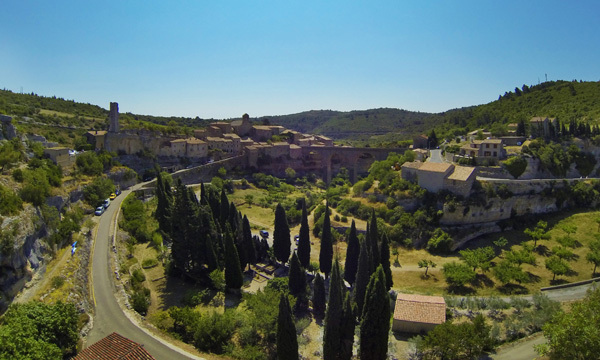 Upon mooring, your Tour Guide presents options for today’s excursion: Oppidum d'Enserune, a pre-Roman hill-top settlement, and one of the most important archaeological sites in the region; or Pezenas, a town of art and history. The city's historic center has become a lively bohemian haven of specialty boutiques and local cafes. Back onboard, join Chef for a cooking demonstration, and then enjoy drinks and dinner. 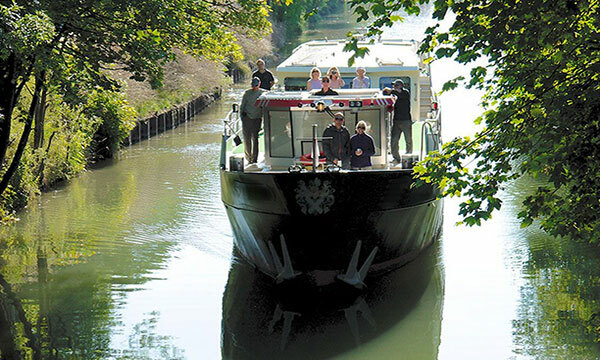 Relax on deck during a morning cruise, or meander the towpath with a gentle pedal or leisurely stroll. 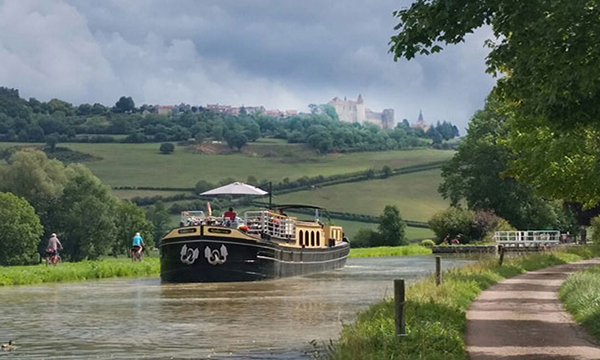 The choices for today’s sightseeing further your discovery of the Canal du Midi. A guided visit to the l'Abbaye de Fontfroide reveals a restored Cistercian monastery founded in the 11th century, while those interested in the region's viticulture can choose a winetasting at the local cellar of a top sommelier, highlighting the complexities of the Languedoc's grapes. Return to the barge for cocktails and a gourmet dinner. A visit to Narbonne begins the day. As a regional capital established in 118 B.C.E. as a Roman colony, preserved Roman ruins are presented in public spaces, while the Narbonne market reflects the region’s gastronomic bounty. Your Tour Guide returns you to the barge for an afternoon cruise. Upon mooning, bookworms are invited to browse a unique book shop with approximately 50,000 second-hand books! Afterwards, visit Chef in the open kitchen for cooking demonstration while enjoying drinks and dinner. This morning, your Tour Guide chauffeurs you to Minerve, a preserved Medieval city with fascinating social, historical, and military import. A tour and tasting at an olive pressoir follows. Return to the barge for an afternoon cruise. Visit the Captain in the wheelhouse, take a bicycle ride, or enjoy a dip in the hot tub. Or, a private wine tasting in a renowned Minervois domain can also be arranged. Join Chef in the open galley to observe French cooking techniques, and culminate the day with another gourmet dinner. This morning, the choice of your cultural activity is yours! Your Tour Guide chauffeurs you either to Carcassonne, a fortified Medieval fortress with a walled city and preserved ramparts; or Lagrasse, a little village in the heart of the Corbieres where charming avenues house a multitude of specialty boutiques and craft shops. An afternoon cruise is the perfect opportunity to laze on deck in the hot tub, or take a final bicycle ride along the canal. Tonight there is a special cocktail hour and celebratory Captain’s Dinner, ending your cruise in style.